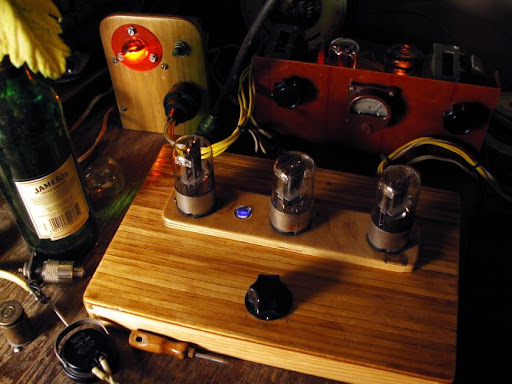 Anyway, pair of tied in parallel triodes inside this vacuum tube in the grounded-grids amplifier circuit offers more than six times power amplification and accurate input impedance matching via the 1:4 autotransformer. Maximal plate power dissipation of these twins is 12 watts, so you can got more than 25 watts output power without overheating - it should be interesting if you have Yaesu FT-817, Elecraft K2, Icom IC-703 or any other QRP transceiver, if you need some, but not too much extra power and, of course, if you love the magical glow of valves. By the way, about a glow - in this amplifier I managed to use an automatic bias circuit stabilized by two LEDs. As said one of my friends: "I love that Christmas Tree biasing! ", but in my case these LEDs are red, so we can rather speak about the deer's noses, I think. This shiny circuit provides a stabilized 2.5 volts bias and it is very easy to move the triode deeper into the "C" class - you just have to add more LEDs. Input impedance matching transformer T1 is wound on a little ferrite tore found in the IF stage in some solid state radio - not so important, just try to find the ring (one for the Dark Lord on his dark throne for example) and wind 7 turns of the double twisted wire, then connect the beginning of one winding to the end of another as shown. Seems that that's all about the scheme, you're ready to Do It Yourself. Oh, yes, L1 is a common RF choke, it should be possible to use a homebrew one, dozen coils of enameled wire on a ferrite rod. All capacitors are mica or ceramics, C3 must be HV type, 500 volts at least. Pi-network data see below. I noticed your blog on reddit. Very interesting projects and great descriptions. The added touch of the Jameson bottle made the pictures even better. Hi, love the circuit! I started with transistors as a child, so learning vacuum tubes in my late 30's is killing me. The resources are limited nowadays, and I am having to scrape and interpolate/extrapolate what I can. I think I can modify your circuit to broadcast on the AM band (just experimenting). 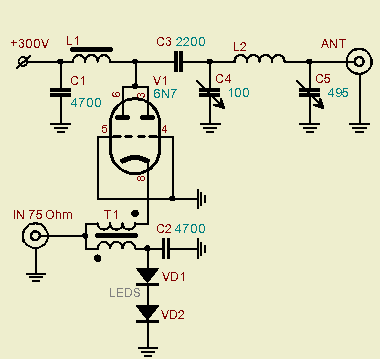 I am having a difficult time finding circuit info for various designs, including calculations. 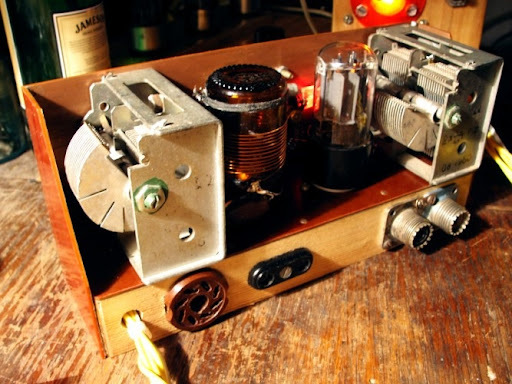 Just because this 6n7 amplifier needs an external modulated oscillator to work as an AM transmitter - it is not as easy as those single tube broadcasters. I managed to source a 6n7, but wondered about the cap values. Are they in uF or pF? Hi Matt. All caps are in pF, good luck. 300 VDC supply, how much current... mA? A great website! I love the formatting. It is very pleasing to look at. I'm sorry, but I doesn't remember exact metrics - If you have a 100mA plate supply, it should be enough. Nice circuit! It will go well with my K1. So is the matching input transformer just wound on a round toroid, if building it from scratch? Also would a blocking cap on the input (to keep DC out of the transceiver) be a bad idea? 1. Sure, it is usual small toroid, I've used a low frequency toroid from IF tract, as I recall. Is this circuit suitable for operating a 6BX7 twin triode ? if i want to add a second 6n7 would i parallel the 4 plates and would i parallel the cathode also. second question you are running this amp in class c if you you wanted to bring it up to class b would you remove the leds? I'm new to tubes and trying to learn as much as I can. If you would like to add a second tube, you have to parallel everything, but take in account that the input as well as output impedance will be divided by two, so that Pi-network should be readjusted (more plate capacitance, less inductance). As for input circuit I'm not sure - let's experiment! I'm considering this a starting point for a retro-cool linear to pair with a Peaberry SDR. I'd like abit more gain, as the drive from the Peaberry is about 1W. I see no reason not to try the 211 or 811A at 430-450V as that is a common plate voltage available from off-the-shelf guitar amp transformers. However, the cathode impedance is going to very high. I've got the 6N7, but I've only got 160v. Will it still work at this low voltage ? transceiver "3T" (I promise to write a separate article or two about this three tube transceiver project later). Здравствуйте Сергей. Помнится что ВЫ уже публиковали материал об этом трансивере. Сейчас не могу найти. Вы убрали публикацию или я что то путаю? Нет, тут не публиковал - есть кратенькая страничка со схемами http://www.qsl.net/ur3ijc/3t.html, но я же на нем долго в эфире работал, схема немножко менялась, да и хотелось подробно расписать всё, с монтажными фотками. Как-нибудь сделаю, после войны. Я извиняюсь конечно же Андрей, ошибся. Ok here it is 2016 and I finally saw the 6N7 amp. Well I gave it a try using 2 6N7 tubes at 430 volts DC plate. It draws 25 mills with 3 leds in the cathode. Seems to work just fine. Now I have to find the right toroid mix and size to get the input SWR down. Been a fun project. The power on 80 and 40 m is near 50W. On 20m about 40W. 73 from Lithuania. Vidmantas (Vidma) LY2HT. Hello Andy, thank you for this project, quite amazing! I'm about to build your circuit, but I'm planning on using two EL84 tubes in parallel connected as triodes (? ), accodring to the datasheet g2 connected to a. and 250V plate voltage. 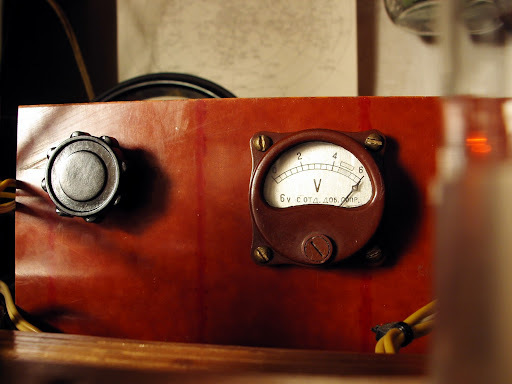 But I'm not sure about the impedance in that case... could you help me understand the calculations for the impedances? Also I'm winding L1 on a 50-43 ferrite toroid, 12 turns #22 wire, is that right?.